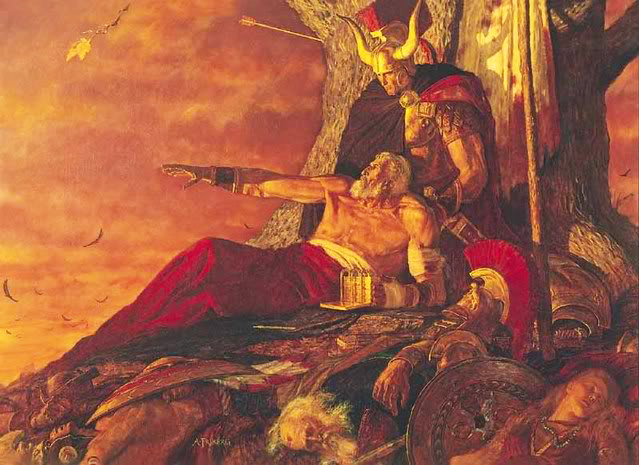 The old man in the picture is the King of the Nephites, Mormon. At his side is his son Moroni. What you see in the distance are vultures circling, indicating the terrible slaughter that their army, and the army of the Lamanites, suffered. This war destroyed both civilizations, and there were just a handful of survivors after it. Next to Mormon are The Golden Tablets, which were the written history of his people, and were given to his son Moroni, who buried them in the hopes that one day they would be recovered. I am not Mormon, but many people in my family are. And I live in Arizona, where a lot of these people of this faith live. Their preferred name, by the way is Latter Day Saints, usually abbreviated to LDS. My interest in history led to an interest in genealogy, and that led me to The Family History Center in Mesa, Arizona. I was also fortunate enough to have spoken to a student of mine at the Art Institute of Phoenix in the late 90s about it, and she was kind enough to give me some books - mostly for children - that helped me to understand her faith. In a longish life I have come to realize that the faith of one person is the cult, or superstition, of another. Having respect for other people's faiths is something that I have been striving to do since I was 12 years old, and it's part of the man that I wanted to grow up to be. I'm still working on it.